PM Update: Storm totals updated at 11:30. The Dulles amount was slightly short of the daily record of 4.7" in 1994, but BWI broke the 1969 record of 3.7". Blacksburg, VA also set a record with 5.3", surpassing the 0.3" of 2005. In this outside-the-Beltway location, a total snow depth of 5" was measured. Some storm totals from around the region reported by the National Weather Service as of 11:30 am are listed below. With the winter winding down, many snow fanboys in the Washington metro area are bitterly disappointed as what was advertised to be a major snowstorm today appears to be seriously underperforming, especially west of the I-95 corridor. 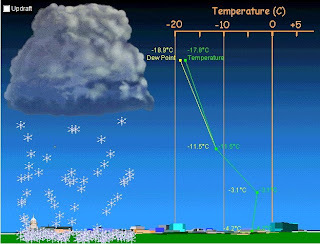 If you're feeling cheated by the ongoing snow drought, or if you just want to learn more about the precipitation process, Steve Ackerman and Tom Whittaker of the University of Wisconsin have a very slick Java applet for teaching precipitation types based on the distribution of temperature and humidity. Drag around the temperature (green line) and dew point (yellow line) and see how that affects the type and amount of precipitation, if any, reaching the ground. See if you can produce all 7 possible precipitation types. If you thought precipitation forecasting was just watching radar blobs move around, this tool shows there is much more going on in the third dimension. Blog Reports Winter Not Yet Over! A coalition of 90 environmental groups has called for a demonstration called Capitol Climate Action on Monday to protest the coal-fired Capitol Hill power plant in Washington. (This event is not affiliated with CapitalClimate; note the subtle spelling difference.) The cold-weather blog, where all the news is numb and number, has wasted no time in pointing out that the region is under a Winter Storm Watch calling for as much as 8" of snow. While March snows are rare in the Nation's Capital (4" or more on a single day occurring about once a decade), the March daily record of 11.5" was set as late as the 29th of the month in 1942. With only 0.04" of precipitation falling as light snow and sleet in the last few hours before midnight, the February total of 0.35" is a new record low for the month in Washington, DC. The old record since records began in 1871 was 0.42" in 1978. The chart shows the 10 driest Februaries since 1871. 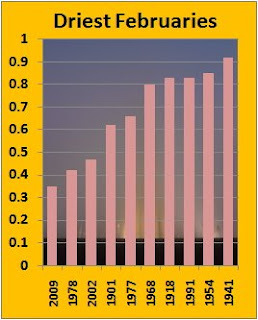 The monthly total has been below 1" only 3 additional times, 1872, 1974, and 1925. At Dulles Airport, the 0.36" for February was above the 0.25" of 1978. However, the 0.01" before midnight at BWI Airport brought the monthly total to 0.26", breaking the previous Baltimore record of 0.36" in 2002.